How do you choose between a Radial and a full rig when you want to compete at the highest level for your age group and you want a shot at winning? Two sailors from Sydney showed that you can't choose a rig by your weight. Brendan Casey was at least 180 pounds (81 kg) when he twice won the Open Radial Worlds and Peter Heywood was 150 pounds (68 kg) when he came 5th in the Standard Master Worlds. Each sailor was way outside the recommended weight for their rig, and yet both were extremely competitive as the results show. So, what does this mean? For me, it's simple: you practice against the people who give you the most competition - if the locals sail in full-rigs, then you will look for ways to join them, and if they sail Radials then you'll consider Radials. But for the big events (for me a Worlds), you need to take more into consideration: your weight, height, the expected conditions, health, conditioning and which rig you've been practicing and competing in. It was clear at the Oman Worlds that many of the Masters and Open sailors including Robert Scheidt had lost weight in preparation for the expected light conditions. And in windy venues, many of the tops sailors will arrive with extra weight. I put on 10 pounds in preparation for Chile and was 185 pounds (83 kg). It was one of the first times I ever felt in control of the boat in a breeze. I was only passed once upwind in the entire 11 race series. When you are light and sailing in waves in a breeze, you tend to get knocked around going up and down waves but with the extra weight that doesn't happen as much. Mark Bethwaite's comment was that between the prior Worlds and the Chile Worlds, the difference was that I had learned to sail in a breeze. For me, the extra weight made a huge difference. I showed up light in Halifax weighing just 168 pounds (76 kg) unable to put on weight after a change of diet. While very competitive in the light stuff, in the heavy breeze, I was suffering. The front row tended to be even and I would finish within 30 seconds of the front row but that usually meant 5th to 7th place. I was fit and had trained hard for Halifax but just couldn't hang with the front row. The only time I had speed and led was in the light stuff but it was mainly a windy series so my finish position was 6th. For me, being that light put me at least 10 seconds per upwind leg off the pace of the front row. Frustrating to lose ground to the front row every upwind leg. Some sailors like Al Clark and Steve Cockerill are fortunate to have the choice of being able to switch from one rig to another based on the expected conditions since they get the opportunity to practice against good competition in both rigs. For others, the decision is harder. If I look back at the conditions in Oman and my lack of practice in a Radial, my decision to sail a Radial was wrong. 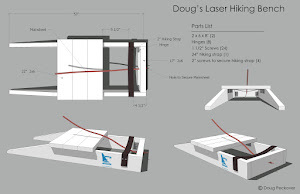 But if I look at my health issues at the time (shoulder, vision), it was the right decision. So for the major events, it's clear to me that each person has to make his or her own decision, then enjoy the ride, and learn from the experience. Naturally your thoughts on this topic are in the context that you are a very good sailor, one of the guys who is always at the front of the Masters Worlds fleet. 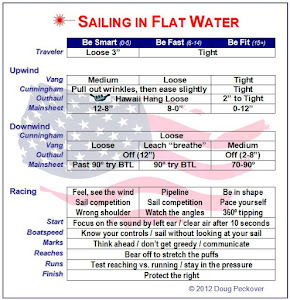 So your thoughts about how your weight affects your sailing is about how the difference between 168 and 185 lbs can be the difference between 1st and 6th in that fleet. Would you care to offer an opinion on how that weight difference would affect the results of a sailor in the bottom half of those same fleets (i.e. someone like me.) Would it still mean a delta of about 5 places, or less, or more? Of course an easy answer would be to say that other factors are way more important for that bottom half of the fleet sailor. Getting a good start vs a bad start. Going the correct side of the beat or not. Not capsizing so much. And this is true. But assume all other things - skill level, fitness, etc. etc. - are the same from one Masters Worlds to another for that sailor. How many places would he move up the fleet if he were 185 lbs rather than 168 lbs? Or even more relevant to me, 200 lbs vs 185 lbs? The closer you are to the front of the fleet, the smaller differences there are in boatspeed. In the front row, boatspeed is almost identical, so it's the little things that matter. 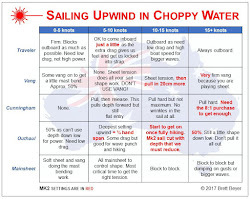 Things like weight, missing a shift, having a new sail, etc. And conversely, the farther back you are, the bigger differences there are in boatspeed, so things like weight, missing a shift, and having a new sail become less important. But all things being the same, being close to the ideal weight for your chosen rig is best. But by how much? Suppose you weigh 200 pounds (91kg) and are preparing for a regional regatta that attracts 50 boats. Last year, you finished in 35th place and are looking for an excuse to shed 20 pounds (9kg). Your friend Bob is the same in every way, but does not shed any weight. In a breeze, you might be able to stay with Bob if you lost your weight by exercising. But in lighter and medium conditions, you would have more boatspeed than Bob. I'd expect you'd finish 5-10 places ahead of him in those races.